The building permits for Wesley Homes Bradley Park have been approved by the City of Puyallup, allowing the retirement community’s construction to begin. “We’re grateful to the city for working with us to approve the permits, and we’re looking forward to providing residents in east Pierce County a new option for senior living with a full continuum of care on one campus,” said Kevin Anderson, Wesley Homes’ president. Absher Construction started work on the site in March this year when Wesley received the civil permit for site work. Before building could begin, the site had to be cleared and graded, retention ponds had to be dug out and water, and sewer and power utilities had to be installed. With construction underway, walls went up for the Brownstone’s underground garage. For safety and security, no one is allowed on the site except members of the construction crew. But the public can follow the progress on Wesley’s Facebook page, a Wesley Homes spokeswoman said. The first phase of construction includes the Brownstone and Lodge apartments, as well as catered living and assisted-living memory care. Plans for the second phase include another Brownstone and a care center with private rooms offering skilled nursing and rehabilitation. As construction continues, the first residents are selecting their new Brownstone apartments. Customizations include options in flooring, countertops, paint and more. The deadline for customizations in the Brownstone is Oct. 31, Wesley Homes officials said. The Bradley Park site is Wesley Homes’ first retirement community in Pierce County. Established in 1944, Wesley Homes is a not-for-profit organization. Wesley Homes operates two retirement communities — Wesley Homes Des Moines and Wesley Homes Lea Hill in Auburn. In addition, Wesley Homes Home Health provides Medicare and Medicaid-certified services, in-home care and hospice services to clients in King and Pierce counties. 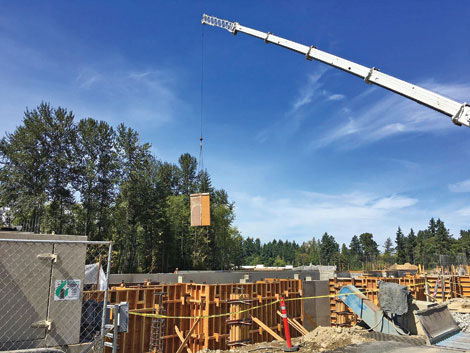 A crane moves material into place for construction workers at the site of Wesley Homes’ new retirement community in Puyallup. Log in | 49 queries. 1.333 seconds.